The look and feel of Paris can be traced to planner Baron Haussmann's overhaul of the city in the 1860s. The city had been essentially unchanged for centuries, and increased congestion made change a necessity. Haussmann oversaw a "renovation" that would turn Paris into the first large, modern city: one marked by iconic wide boulevards and distinctive streetscapes. But modern Paris continues to co-exist with elements of the more anarchic medieval city, as well as with areas that still betray their suburban roots. This leisurely paced documentary follows noted architectural historian Francois Loyer - an expert on 19th-century Paris, on a tour of the city. We travel through streets and stairways and out onto rooftops, as Parisians go about their daily business and intimate affairs. 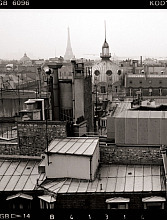 The film reveals how Paris has been shaped by its particular interplay between public and private space, and between order and disorder. 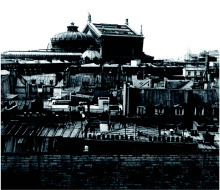 Haussmann did not see the need to completely destroy chaotic old neighborhoods. Instead, he created a flexible system - one in which boulevards reflected a graceful new look, while old neighborhoods like Saint-Severin, characterized by narrow streets and tangled low housing, remain to this day as fragments of the old city. Similarly, bourgeois apartments present an elegant facade to the public, while the functionality and disorder that come with day-to-day life are relegated to indoor courtyards. That same flexibility has also allowed Paris to maintain its integrity as the types of structures within the city have changed. A 17th-century arc de triomphe that once towered over its neighborhood is now overshadowed by apartment buildings. Regulations allowing increases in height above the cornice line, only if they are set back from the lower storeys - have resulted in buildings that have grown by 10 metres over a century without affecting the integrity of the famed Parisian streetscapes. For well over a century, Paris has managed to balance these elements. But over the last few decades, as people retreat from public space into their own interior environments, that careful balance is now threatened. First released in 1991, Paris 19th Century, The Invention of a Modern City remains a fascinating study of one of the world's great cities. An ideal film for architects and architectural historians, this DVD also serves well as a companion piece to Paris Ring, on the Boulevard Peripherique circling the city. The story of the road round Paris, the most significant 'redevelopment' project in Paris since Haussmann's time.